RobstenClan: Fashion of The Day - Blue Jean Way: Robert Pattinson Totally Loves … American Eagle Skinny Jeans! Fashion of The Day - Blue Jean Way: Robert Pattinson Totally Loves … American Eagle Skinny Jeans! TheFashion-Court Considering Robert Pattinson is such a down to Earth guy, one shouldn’t be too surprised that, despite the uber-success of the “Twilight” movies (as well as his other films), he’ll still pass on the high designer luggage, array of leather jackets, “label” t-shirts and expensive “murses” that you’ll often find on some Hollywood heartthrobs. When he’s off the red carpet, Rob keeps it chill and will stick by clothing he finds comfortable or convenient — which usually involves a vintage t-shirt, worn-in jeans and sneakers. Lately the handsome British actor has been repeating his latest favorite part of his daily uniform -- American Eagle Outfitters skinny jeans! 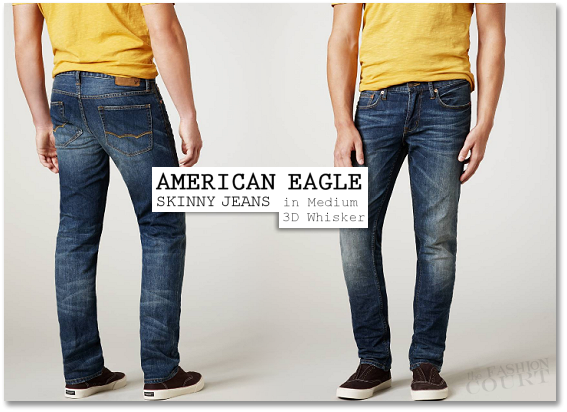 The 26-year-old actor was first spotted wearing the rugged slim cotton jeans in Medium 3D Whisker ($39.95, ae.com) while leaving LA’s Hotel Cafe after a friends concert back in July. Rob paired his denim with a vintage t-shirt and light grey short sleeve button-front shirt that he just had closed at the top. He topped off this low-key ensemble with a black backwards Stussy “Laguna Patch” snapback cap ($28, stussy.com) and brightVans “Old Skool LX” sneakers in Vermillion Orange/True Royal/White ($60, kateskates.co.uk). Rob packed up his blue jean babies and took them on his New York City trip to promote “Cosmopolis” in August. He was seen leaving his hotel wearing them along with a black hoodie, another vintage tee (surprise, surprise), his solid black V-FlexFit cotton twill cap ($26, flexfit.com) and pair of distressed “Pampa” work boots by Palladium ($110, palladiumboots.com). That wasn’t the last you saw his AE threads and you’ll probably see more of them for awhile. Rob took them to work with him for an interview on “Jimmy Kimmel Live” in LA a few weeks ago. He paired them with blue suede “Pritchard” shoes from VANS ($85,vans.com), but you can get full outfit details here. Has Mr. Pattinson convinced you to snag your own pair of AE skinnies?